Many bonsai enthusiasts are introduced to Japanese Kanji (pictograms) in bonsai publications where the BONSAI Kanji is often printed. The bonsai kanji is therefore relatively well known as representing “tray(bon-) planting(sai). In simple terms, most kanji are stylised derivatives of an older, picture based Chinese language. Versions of it are in common use throughout much of the Far East including China, Japan, Korea and Vietnam, having been exported there during the Chinese Imperialist expansions many centuries ago. There are 2 other forms of pictogram writing in Japan that augment the Kanji system - Hiragana and Katakana (both derived from Kanji) - that express complex and foreign words as well as a system based on the English/Roman alphabet. eg. Honda, Suzuki, Sanyo. You would need to know about 3000 kanji and some of the other 2 scripts just to read a Japanese newspaper; compare this to the mere 1000 words that we need to be know to read most English publications. Each kanji can be one, or any number, of a defined set of over 214 basic “radicals“ or building blocks. Each with a specific meaning (the Bushu). These basic radicals represent items such as people, simple concepts such as big or small, common animals, domestic and agricultural tools, weapons, numbers, food items, landscape features and weather conditions. You only have to think of Egyptian hieroglyphics or the well-known primitive man cave paintings to get a feel for how they developed. Kanji are in fact the sort of picture items that would be needed by people with under developed language skills in order to make themselves understood, to communicate across language barriers or leave messages. In very general terms, each kanji has a name and also a pronunciation or phonetic sound that is entirely different. In most cases there are several possible pronunciations for each kanji - some based on Japanese (the “Kun” reading) and some on the original Chinese ( the “On “ reading). Each kanji can have more than one meaning. Conversely, there are different kanji meaning the same thing and the same phonetic sound can apply to more than one kanji. These building blocks or radicals can be used as kanji on their own or combined to create a kanji expressing a word, a feeling or an idea. This chart shows how Kanji can often relate to each other and how one kanji (hito) can slowly alter into several others. This becomes heavens or sky as the “hat” line has moved on top indicating something over your head/ higher than/ above man? (Bushu Nos. 1 & 9 combined as a kanji). And this one becomes tree (or wood) as it is growing partly above but mainly below the earth line. (Bushu No. 75).Some readings say “Ki” is a tree with sweeping branches. And to perhaps answer a question – this one is woman. Same 2 legs and arms as man, but is she pregnant I wonder? (Bushu No. 38) Some readings say this is a kneeling woman with outstretched arms. As an illustration of how basic and simple combinations can be, take a look at the following Kanji example. As previously stated, much of the original picture (Kanji) language has become very stylised due to writing techniques and artistic license rather like medieval illuminated script. However, hopefully it will be a little clearer when we look at some more examples. Some kanji are quite obvious with just a little imagination - the stick man and the very “tree-like” tree and forest kanji in the charts above are prime examples. Other Kanji combine images to convey more complex ideas like the examples below. 1. This is the kanji for rain and consists of the radical for a hanging scroll with water droplets. The scroll is hanging from a “heaven” line so we have the sense of a wet in the sky. 3. This is the kanji for dish that appears as a radical in the Bonsai kanji. It Looks like a line of plates in a rack. 4. This is the kanji for blood. I particularly like this one.As you will see later it represents a broken plate(s) and who hasn’t cut themselves in a domestic accident? The brief excursion I have taken into the Bonsai kanji and the various radicals (Bushu) that are employed, reveal potentially much more, including I believe, what may be double meanings and puns. 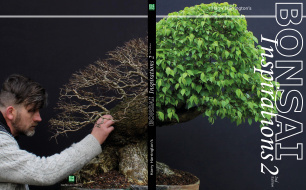 A pal of mine, Richard Fish, was told the following about the Bonsai Kanji by his Japanese teacher and put some of these ideas forward on an internet bonsai discussion forum. I have pondered these initial ideas more than once. This is how we derive “Tray” seemingly. i.e. a dish, divided, cut or sliced (horizontally) will give a thinner dish or tray as often used for bonsai.